Elongated, extremely slender predators like the Hound Needlefish (Tylosurus crocodilus) and the voracious Chinese Trumpetfish (Aulostomus chinensis) are also found here. 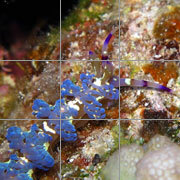 Known as the "nūnū" to local Hawaiians, the Chinese Trumpetfish is able to camouflage itself by changing colors. 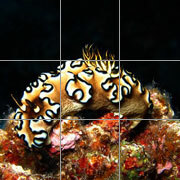 Reef fish are noted for their dazzling colors and intricate body patterns, rivaling if not exceeding the insects, nudibranchs, and birds-of-paradise in their splendor. The Hawaiian reef community is not lacking in this regard and is replete with some of the most beautiful fish in the world. 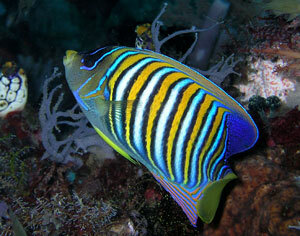 These include the elegant angelfish, the magnificent butterflyfish, the intricately-marked and brightly colored surgeonfish, the unique parrotfish, and the flamboyant triggerfish with their bewildering color patterns. 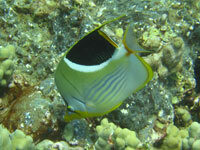 Seven species of angelfish have been identified in the waters surrounding the Hawaiian Island chain. 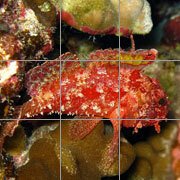 Most of them are found in shallow water, all but one are dwarf species, and four of them are endemic to the islands. 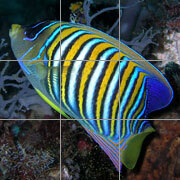 One species, the stunningly beautiful Emperor Angelfish (Pomacanthus imperator), is extremely rare. 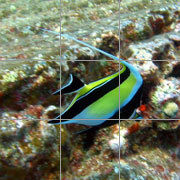 The Bandit Angelfish (Holacanthus arcuatus - also described as Apolemichthys arcuatus and Desmoholacanthus arcuatus) is the only large angelfish in Hawaiian waters, attaining a length of about 10 inches. The smaller Potter's Angelfish (Centropyge potteri) is gorgeously attired in a marbled orange and blue pattern which varies with each specimen. 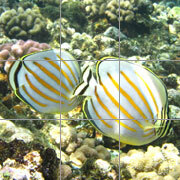 A typical dwarf species, Potter's Angelfish grows to a maximum length of only 4 inches. 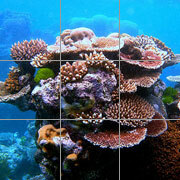 Twenty-five species of butterfly fish inhabit the coral reef systems of Hawaii. Among the most beautiful of Hawaiian reef fish, the butterfly fish have developed different feeding strategies, some of them living off small, bottom-dwelling invertebrates, others feeding on coral polyps and the mucus secreted by them. These spectacular fish appear in a bewildering array of color patterns dominated by brilliant yellows and dark, vertical eye bands. All are impressive, but the Raccoon Butterfly (Chaetodon lunula), Ornate Butterfly (Chaetodon ornatissimus), Threadfin Butterfly (Chaetodon auriga), and Longnose Butterfly (Chaetodon flavissimus) are exceptionally beautiful and distinctive. Twenty-three species of surgeonfish have been identified and described from the waters surrounding the Hawaiian Island chain. These strikingly-marked algae-eaters are closely related to the unicorn fishes, a bizarre group of fish distinguished by a single, horn-like structure protruding from their foreheads. The stunning and regal Moorish Idol (Zanclus cornutus), one of the most beautiful of reef fishes, is in the same order as the unicornfish, but in a different family. 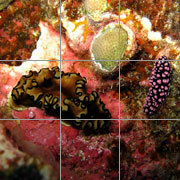 This sponge-eating jewel of the reef sometimes forms large, majestic schools as it forages for food. A truly unforgettable sight! 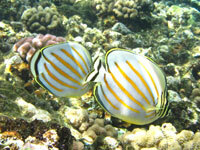 The exquisite tangs are another group of reef fish that are closely related to the surgeonfish and unicornfish. Like them, they are brilliantly colored and sometimes complexly marked. Hawaii is blessed with a number of magnificent tangs including the gorgeous Yellow Tang (Zebrasoma flavescens), the distinctive black and orange Achilles Tang (Acanthurus achilles), and the striped Convict Tang (Acanthurus triostegus), one of Hawaii's most common reef fish. 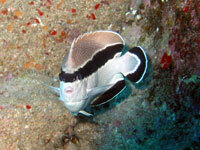 At least 8 (and possibly 9) species of triggerfish occur in the waters surrounding the Hawaiian Island chain. These incredible fish are characterized by oval-shaped, somewhat angular bodies with strong shell-crushing jaws, no pelvic fins, and eyes well above and behind the mouth and set near the top of the head. 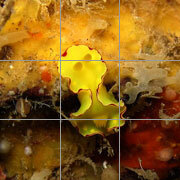 A few species feed on algae but most forage for small benthic, shell-bearing invertebrates. Triggerfish are unpredictable and can be ill-tempered and aggressive, but they are extraordinarily beautiful. 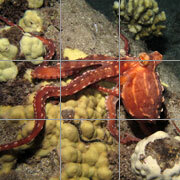 Their complex markings and color patterns almost defy belief. 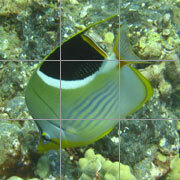 In Hawaiian waters, the Picasso Triggerfish (Rhinecanthus aculeatus) is rivaled in beauty only by the Rectangular Triggerfish (Rhinecanthus rectangulus). 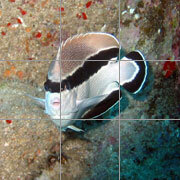 Known as the "humuhumunukunukuāpua'a", the exquisite Rectangular Triggerfish is the official state fish of Hawaii. 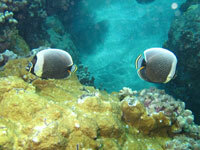 Other Hawaiian species include the algae-eating Durgon or Black Triggerfish (Melichthys niger), the common Lei Triggerfish (Sufflamen bursa), and the Blue-Throated or Gilded Triggerfish (Xanthichthys auromarginatus).